Nothing will ever make you look quite as cool as owning a handgun flash drive. Sure, you can’t take it in most places, due to the stir it might cause. At least you’ll look tough though. With your jet black drive, I’ll bet you only store the toughest of your information on the drive. I haven’t the faintest idea what kind of information would be called tough, but I’ll bet you figure it out. The drive itself won’t shoot anyone, but you might be able to fend off the dumbest criminals of the world. Hidden within the handle itself is where you’ll find the USB port you need. On that drive you can store up to 4GB of pictures and documents. That’ll give plenty of room, especially for the price you’ll pay. The drive will only cost you $22 through USB Geek. Only thing this drive will do is get you shot or arrested if anyone complains you used it to cause terrorist behavior. Only an idiot would buy such a dumb device. If you really want to be tough, you buy the real thing and least if you get shot, it won’t be over some dam toy drive. My blue 4GB Bracelet USB Drive http://www.uxsight.com/product/1829/4gb-bracelet-usb-drive-flash-memory-stick-blue.html is a ideal decoration for my wrist. Never worry it will fall down. Though the price is under $20. But it’s not the coolest one in the market, I know. This Handgun USB Drive is very cool, every boy will like it, I believe. This USB Drive is cool, but the capacity is too small for me. 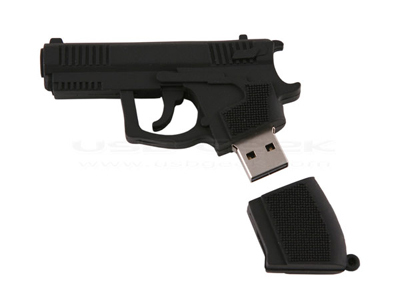 Do you have such 8GB handgun USB Drive in stock? Really like this special design drive. “Shot or arrested?” What kinda dork…? If you’re dim enough to believe somebody makes a functional 2″ auto handgun, or that it would fool anybody, you deserve to get arrested. OTOH, if you’re a proud gun owner and want to tweak the anti-freedom crown, this looks like a winner.